One of my favourite pieces of clothing and it should definitely be a must-have in every girl's wardrobe — midi culottes! I cannot even begin to describe the comfort level of midi culottes. Aside from being uber comfy, midi culottes are so easy to dress up because the flowy ones can easily pass off midi skirts, you can easily dress it down as well. Now that i have got a black and white pair. I'm looking for maybe a powder blue one or grey! Gonna collect them alllllll. Preenk also sent me a dress in this bark print that they have specially selected for their S/S 2015 collection. This print is so lovely and it's also available in a maxi dress, maxi skirt and shorts version! One of my favourite dresses! This is such an overdue post but I wore this outfit sometime around the Coachella festival timeframe and if i were to go for Coachella, this is definitely the outfit i'd for. The flowy white dress with bell sleeves exudes such a relaxed and chill vibes. Perfect for prancing around. All decked in Zalora basics! A lazy day outfit for desserts with friends. I still haven't figured how to tie those lace-up sandals without the straps falling down to my ankles every 10 minutes. I probably re-tied my sandals 5 times that day. Outfit for last weekend when I went out for durian desserts with my friends! I think my new obsession is scallop hems. Just got a dress in powder blue + scallop hem! Pardon for the lack of updates but I have been really busy (stuffing myself with food) lately. You can follow me on Instagram, I update (slightly more) frequently over there! 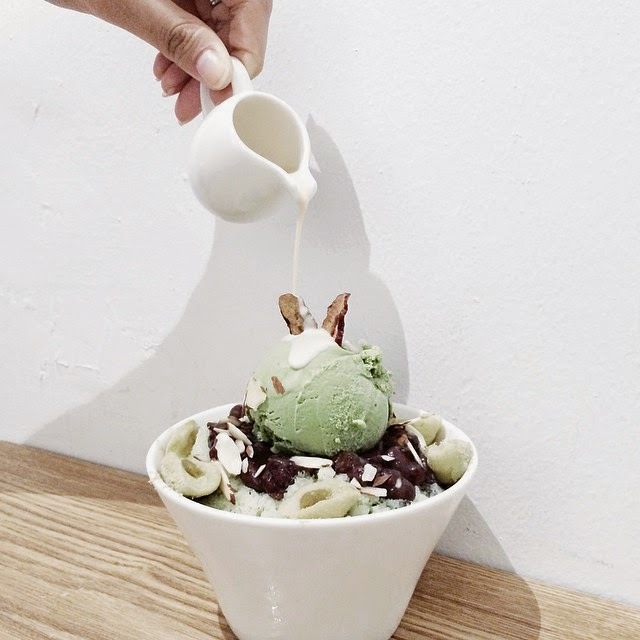 One of the lucky ones to try out Violet Herb’s food tasting with OpenRice SG! We asked Danni (the co-founder) about the name and she mentioned that there are very little herbs that are actually violet in colour so that’s what they aim to be - special and outstanding. Honestly, I’m not a fan of Violet Herb’s purple interior but it definitely suits its name and stands out from the surrounding cafes and restaurants. The cozy, candle-lit restaurant is sure inviting and not at all pretentious. Violet Herbs also has a dining space on the 2nd level and it boasts a homely brown and white décor with huge windows. Moving on the appetiser – Mango Scallops. Mango and seafood, such a great combination. 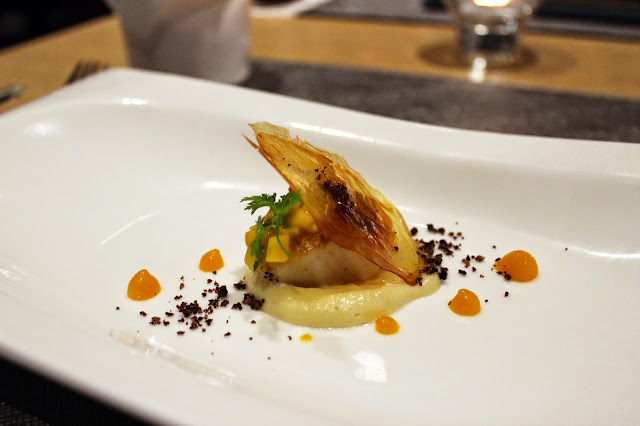 The sweetness from the mango gel and savoury parsnip puree works really well together. Parsnip Velouté with fresh Sri Lankan crab, edible flowers and drizzled with herb oil. I really enjoyed the texture and taste of the parsnip but I could barely taste the crab. Next up, Truffle Foie Gras with an hour poached egg. Instead of the regular, runny poached egg, this one had a velvety texture. 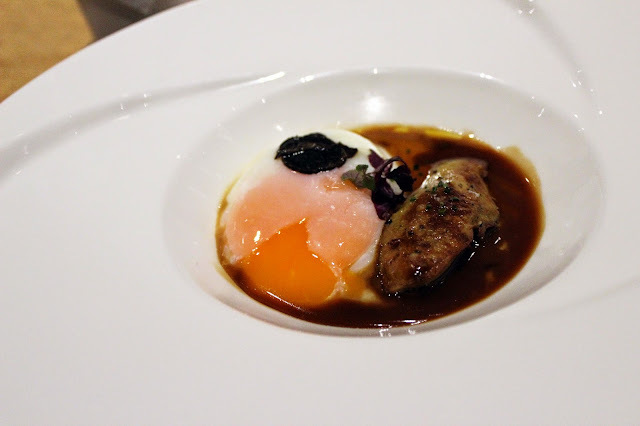 I absolutely love foie gras, eggs and truffle so this was easily the highlight of the tasting for me. Braised Kurobuta Pork Belly, with asparagus and spicy blood orange sauce with a side of herb fries. Even though the combination worked well for me, the pork belly wasn’t as tender as I thought it would be. It didn’t have the melt-in-your-mouth texture I hoped for. The last dish before dessert – Marinated Red Miso Cod. By this time, I was getting kinda full so it didn’t stand out as much to me. I would truly enjoy the cod if I was hungrier. The cod was marinated well and it still retained the natural sweetness of the cod fish. I didn’t like the almond and fried parsnip eggplant that came with it though; it left a tangy and uncomfortable aftertaste. 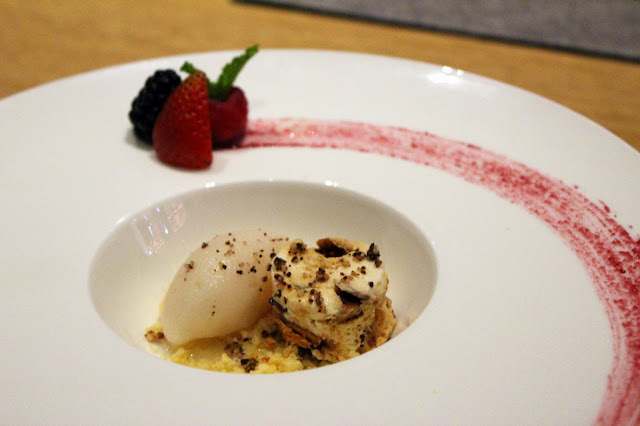 Dessert was Frozen Nougut with lychee sorbet, plated prettily with mixed berries and raspberry sauce. The crumble underneath the nougat was slightly savoury. Love the sweet and salty combination! That concludes my food tasting with Violet Herbs. Overall, I truly enjoyed the tasting and every dish that was served. 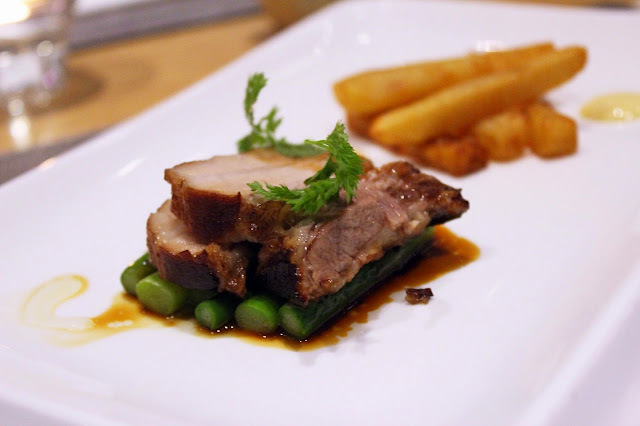 Violet Herbs offers fine-dining dishes at affordable prices so drop by and check it out soon. Started off the month of May with a couple of my best friends and durians!!!!! (On a side note, is durian not a word in the dictionary? It's being underlined with a red squiggly line.) If you know my love for durians, you'd know that I'm soooo glad that the durian season is back once again! Noel, Tiffany and I dropped by Goodwood Park Hotel for tea time! Feasted on Durian Strudel, Durian Rainbow Ice Cream Cake and Durian Mousse Cake - I actually can't decide which is my favourite, i love them all! Best part was - it didn't left us feeling gelat so we could have more of 'em durians!! The Durian Mousse Cake is slight lighter than our previous cake. The creamy durian mousse was accompanied with soft sponge layers and topped off with sponge cubes, allowing a good mix of texture. The Durian Rainbow Ice Cream Cake is probably one of the top hits, almost every other table were having this. Frozen D24 ice cream layered with a rainbow bread on top, what's not to love right?! 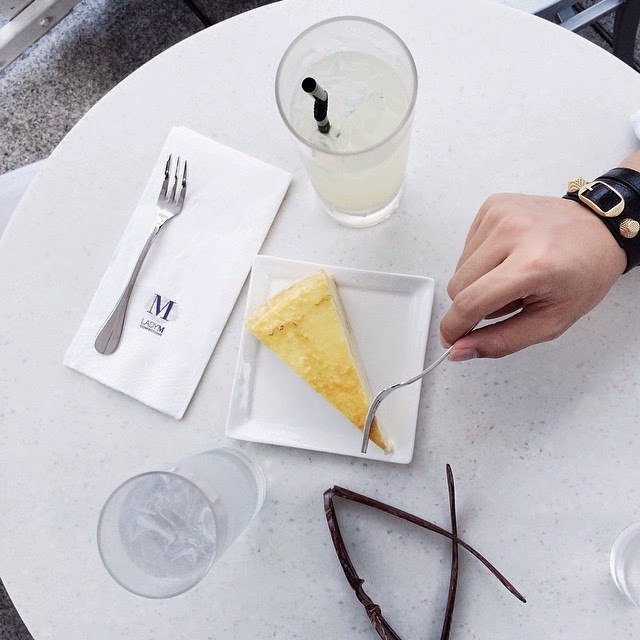 There's going to be a durian desserts buffet from 30 May to 2 Aug 2015 (at $35.80++ per pax), can't wait to go back again! !